Ski 2 Freedom is delighted to have the support and encouragement its Patrons and Ambassadors. In particular we are extremely grateful to the Tobell Family from Sweden. Mrs Inger Tobell, on behalf of her late husband Ernie, is dedicated to ensuring that young people have life-changing experiences on the mountains and known as "Ernie's Children" this project allows us to meet the needs of so many children with often extreme complex health conditions via our Portfolio and donation of much needed specialist ski and sport equipment. We are particularly delighted to share their stories and enthusiasm for life with you. Jamie Andrew is a mountaineer who despite losing his hands and his feet in an accident at the age of 29 climbing the North Face of Les Droites has gone on to make a string of absolutely incredible achievements. 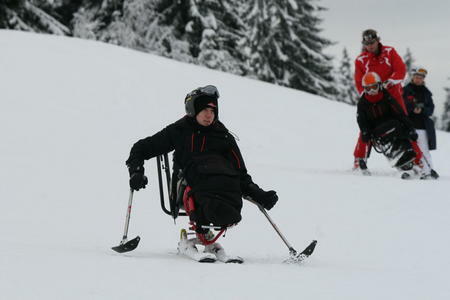 He is great supporter of Ski 2 Freedom and particularly helpful in advising beneficiaries who like, him have lost limbs, and need encouragement to achieve the same dreams as he has done. Catherine Cosby Founder of Ski 2 Freedom first met Jamie when he gave an inspirational talk to the first Battle Back group in Germany. His book "Life and Limb" is truly remarkable and says so much about a man whose humility but strong sense of "give it a go" is an inspiration to us all. Jamie is married and has three children and lives in Edinburgh. He is also a Patron of Disability Snowsports UK and a curator for the Scottish Book Trust. He has also worked with the British Armed Forces on their Adaptive Adventure Training Programme, Battle Back, for wounded servicemen and women and he also works for the Hunter Foundation. In order to empower more people to push the boundaries, the association is delighted to have Ambassadors who embody self confidence. Paralympian Kelly Gallagher's gold-medal-winning skiing in Sochi has already inspired many people who are blind or visually impaired to take up mountain challenges. Charlotte Evans is Kelly's ski guide and has also become an Ambassador. Charlotte's role as Kelly's guide has inspired many people to contact us about how to help blind and visually impaired skiers on the slopes. Max Cosby is one of Alexandra Cosby's brothers and one of her greatest supporters! He therefore brings his own experiences to Ski 2 Freedom along with a love of skiing and the mountains, understanding how these two can be combined to bring joy, revitalisation and a true sense of well-being to individuals and families. Max has been serving in the MOD in London and is now currently undergoing flying training for the Navy. Lieutenant Max Cosby, trustee of Ski 2 Freedom Foundation, shared his thoughts on being the brother of a severely disabled sister with Rett Syndrome with readers of HOMEPORT - the magazine for the Naval Families Federation Autumn 2012. 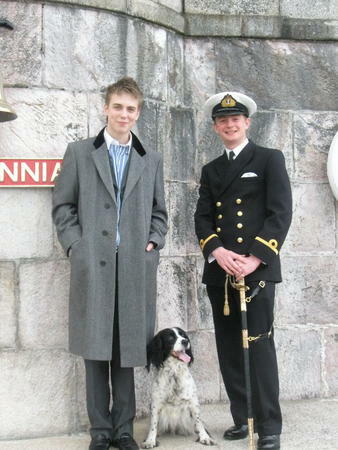 Max had spoken at the FANDF Conference held in the Ministry of Defence in May 2012 on this subject and his comments gave delegates an insight into how someone grows up in a Royal Naval family where there is disability. Having Ambassadors to help promote the empowering benefits of being in the mountains and wild nature, and participating in activities, both sporting and leisure, undoubtedly helps our work and encourages people with all types of conditions needing special assistance to have that ultimate life-enhancing moment.